I know I was whining about uncooperative dragonflies the other day, thinly veiling it with praise for the Blue Dasher, but I did find this amenable near-autumn beauty recently. (I believe it is a meadowhawk, but I haven’t researched it.) When these small, brilliantly red dragons come out, it is usually a signal that the end of the bug season is near in western Massachusetts. I fired off a ton of shots on this individual, mainly because it was munching on something, which always helps. You can’t see its meal, because this shot was the last one I took over a relatively long period of time – sorry, can’t tell you how long (the clock stops when I am in my own personal macro mode). This shot was the last one I took, because I was just about worn out. Trying to get a unique moment in or around each of the dragon’s bites, I realized way too late that I was underexposing by two to three stops. The meal was gone, so I moved on to a new, less-magnified perspective (the one above), which I really liked, but I was still having a tough time getting the result I wanted. And the tough part was mostly those crazy diamonds in the eyes. The shiny, distracting white spots, i.e. specular highlights, are the bane of my flash photography existence, especially concerning compound eyes and especially especially concerning dragonfly compound eyes. Usually worse than these flash artifacts, is the resulting harsh, hexagonal glare from the bright sun. (I want to call this “lens flare,” even though I don’t think that is the appropriate term, mainly for the pun.) The sun was out in full volume, but I thought I’d beat the sun on this one, and I pretty much did. I was sitting on the ground and with one hand – possibly left or right, I can’t remember; I have a righty trigger camera, but I use either hand at times to release the shutter – I shaded the dragonfly. I rested the camera on my leg and fired my shots. Presto: there was no funny sun glare. Yes! Unfortunately, the specular highlights from the flash were very prominent. The diffusion on the flash was not sufficient, and I probably needed to change the position of the flash head (an impossibility at the moment because my current flash bracket has no range of motion). The funny thing is, I used the same exact gear on my aforementioned Blue Dasher post with a different result. Here is a side by side look to compare the specular highlights. On either shot, it is possible to do better, but relatively speaking, the Blue Dasher’s eyes are not overpowered by the flash, whereas the meadowhawk’s front-facing eye has a very bright specular highlight area, almost completely washed-out at the center. I probably should know better (but I’m not really sure) why the Blue Dasher reflections are so much softer. I believe much of it has to do with the interrelated factors of the focal length of the lens, working distance, and position of the flash head. The Blue Dasher is a higher magnification shot and therefore the lens flash is closer to the subject which helps spread or soften the light. The result is certainly there in that particular shot, but you also can see another downside of the static flash head: being so close to the subject leaves heavy shadows on the rights side of the Blue Dasher’s head. By contrast, the meadowhawk is more evenly-illuminated. Twin-head flashes are a nice way to get around this shadowing, but either way, I need to work on getting a more versatile, maneuverable flash set up. 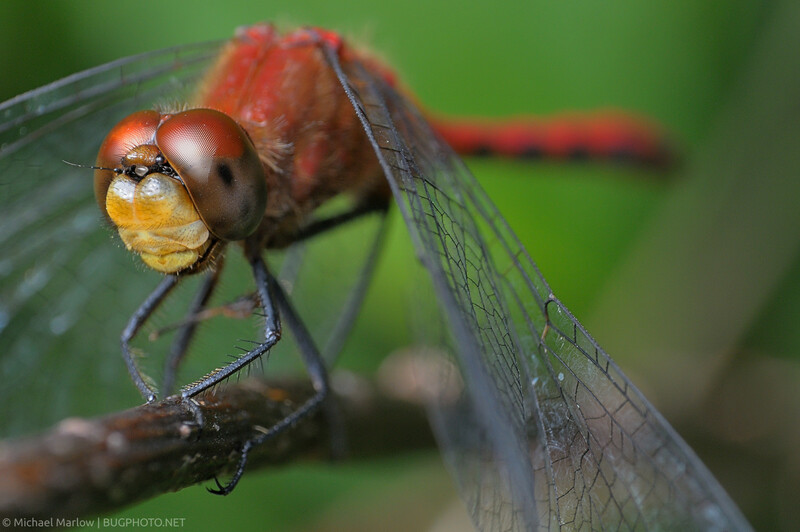 Posted in DragonfliesTagged diffusion, flash photography, Macro Photography, meadowhawk, specular highlightsBookmark the permalink. Thanks for the comments, always appreciated. Making up for that stop or two of light is the tough part, especially when the bugs are moving and your (i.e. my) camera rapidly picks up noise going up the ISO ladder. I had an arm but it broke earlier this summer (probably that cheap = more $$ in the long run thing that you mentioned on your site). I liked it though; it was actually more compact than my flash bracket rig, and lighter too, I think. I’ve been wondering if I can make up part of the difference with a “variable” diffuser, maybe with peel away layers; still in the brainstorm stage, not sure if it would be practical or effective. I’ve read some of Ted’s diffuser posts at Beetles in the Bush, great stuff. Kurt at Orion Mystery has some good posts about diffusers too (with many DIY examples, his own and others; some of them are pretty funky), including for twin flashes.